In a stand mixer, beat Egg Beaters and sugar until very stiff peaks form. The mixture should still be glossy, but with very stiff peaks when you lift the beaters up. In a food processor, pulse together 1-2/3 cups powdered sugar and the almond flour until very well mixed. In a large bowl, use a spatula to stir the egg-white mixture and almond flour mixture. Try to completely combine the mixture in about 8 strokes. Spoon batter into 5 bowls. Tint each bowl with a small amount of food coloring paste. Use a spoon to quickly stir paste into batter, taking care not to over mix. Allow macarons to sit until a thin film forms on top of them, making them no longer sticky to the touch. This layer forms the feet of the macarons, or the smooth upper section, with a rim of bubbles cooking up beneath the firmed part of the cookie when they bake. Once the top of the batter has formed a skin (which will take about 60-90 minutes), bake cookies in preheated oven for 8-12 minutes, or just until the cookies set. You don't want the cookies to brown at all. Remove cookies from oven and cool completely. Gently remove from parchment paper. In a stand mixer, beat together remaining 5 cups of powdered sugar, butter, Fruity Cheerioes™, vanilla and whipped vodka until light and fluffy. Spread a small amount of buttercream between two macarons of the same color. Repeat with remaining cookies. Serve and enjoy. 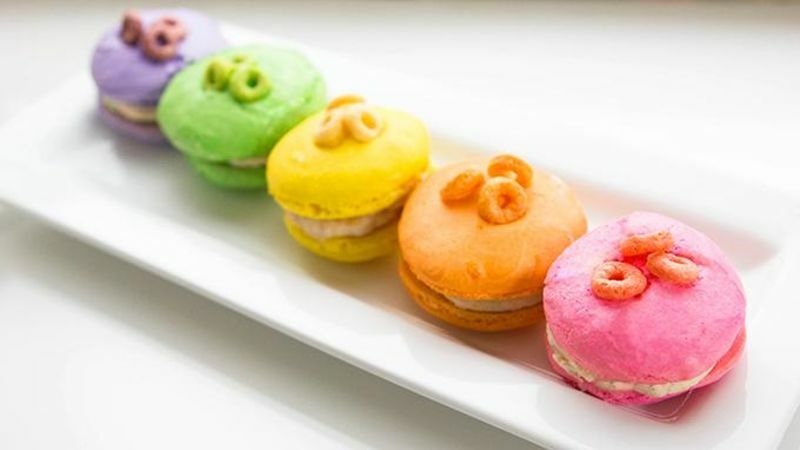 Spring is the perfect time to make these colorful macarons. Our easy how-to shows you the way! In five years of food blogging, I’ve eaten about 4,678 macarons, but I’ve never made one. So when the idea for Rainbow Macarons came into my life, I tackled it with the fierce ego of someone who can hack her way about most kitchen concepts in a matter of minutes. Five batches, 72 hours, and fifteen dozen egg whites later, I am both humbled by the tender macaron, and excited to announce the world’s most perfect recipe. Because, after failing miserably five times, with the sixth one happening with almost perfect precision (and on a rainy day, nonetheless! ), then this recipe will work for you! Macarons are finicky. They’re time consuming. But they’re not hard. A few quick steps, plus a few easy shortcuts, and you’ll be making homemade macarons in no time at all. It all starts with the egg whites. The carton of egg whites in the grocery store works just perfectly. Nab it, measure it, add some sugar, and whip it until there are stiff peaks. You still want the egg whites to be glossy, but the risk here is over-beating them. So beat them long enough, but not too long. Just turn your stand mixer on high and let 'er go until those egg whites can stand at attention the moment you lift the whisk. The second important step is to pop some powdered sugar and almond flour in a food processor. Other recipes will tell you to sift. Don’t worry about sifting, but get those ingredients in a food processor and pulse them until very fine, and very comingled. Start to stir the almond flour mixture into the egg whites with a spatula. About 10 stirs of the spatula and you’ll have this gorgeous batter. Gel food coloring will give you mournful, inedible results (believe me). Liquid food colorings will give you weepy, floppy macarons (trust what I say). So, if you have to hop down to the craft store, it’s worth it. The paste colorings will give you vibrant color and perfectly baked macarons, so it’s worth the extra trip. Divide and tint the batter. Just a smidgen of paste coloring goes a long way. Add as much as you like to get the color you desire, but don’t add too much! Paste coloring can be pretty bitter when tinted en masse. Just add a bit at a time until it's the color you want. Once colored, spoon the batter into zip-top baggies. Snip the corners and pipe a small amount of the batter into a circle on a parchment-lined baking sheet. You want that baking sheet parchment or silpat lined. No nonstick baking shenanigans here! Tap the baking sheet a couple of times against the table. Then gently press a few Fruity Cheerioes on the center of half the cookies (we’re going to fill these babies with a rainbow-hued Fruity Cheerioes buttercream, so this pretty garnishment ties it all together). Now…wait. And wait. And wait. We’re waiting for skins to form. You know how macarons are a little puff on top of a little ledge? To get that little ledge, you have to let the egg whites and powdered sugar solidify on top. Then, as the cookies bake, the “skin” rises above the moist batter below it and you get the perfect macaron shape, with the ledges (aka “the feet”) and all. It’s really quite wondrous. Especially when it works! The skins can take about 1-2 hours to form. Don’t rush the process. Just assume you’ll be baking them in about an hour. Once ready to bake, pop your cookies into the oven for just 10 minutes. You do not want them to brown at all. Remove, let them cool, then fill the sandwiches with a cereal-inspired buttercream that is so creamy, you’ll need a bowl of milk to go with it. One batch. Perfect batch. Every time. Brooke sometimes makes breakfast and snaps a photo of it before feeding it to her ravenously hungry children, then posts it all at Cheeky Kitchen. She joined Tablespoon to bring back the meal of champions, one bowl of slow-cooked muesli at a time. Hit up Brooke's profile for more fast-fun-fab recipes that let you act lazy and eat like a boss.